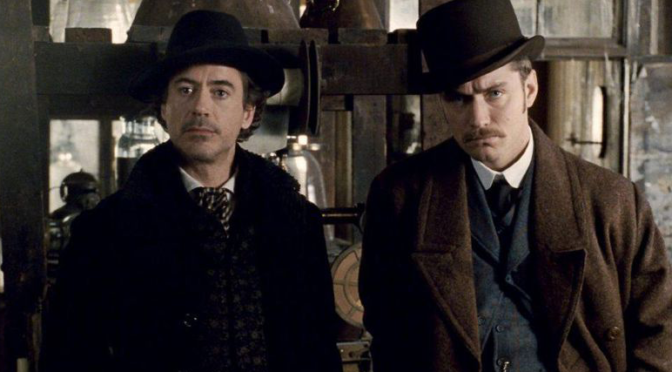 Hold on to Your Hats Kids, a ‘SHERLOCK HOLMES’ 3 is Coming! That’s right, it’s been 7 years since SHERLOCK HOLMES: GAME OF SHADOWS, but it sounds like a sequel is underway. Not only that, IT HAS A DATE. That’s right, the unnamed sequel will bow in theatres on Christmas Day in 2020. Personally I enjoyed the first 2 movies, SHERLOCK HOLMES & SHERLOCK HOLMES: GAME OF SHADOWS. But I can’t say I’ve had a burning desire for more after the last one. Like I said, I enjoyed them. But I could take ’em or leave ’em. That said, no word if Guy Ritchie, the director of the 2 first installments, is slated to return. But of course Robert Downey Jr., and Jude Law will be back. What do you guys think of this news? Drop your thoughts on the FUZZYBUG Facebook Page!